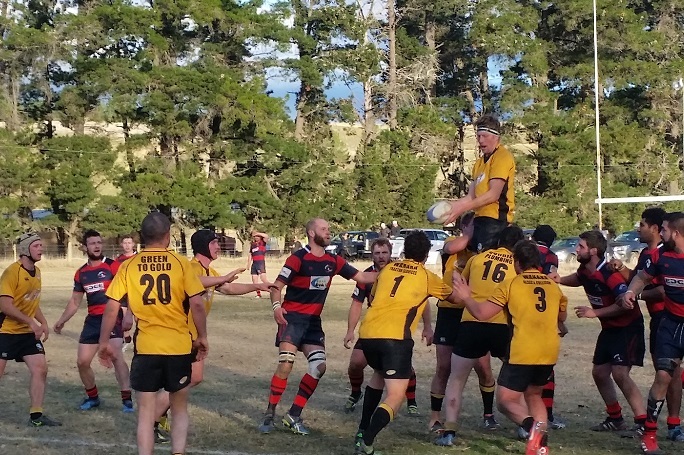 The Neil Purvis Memorial match once again proved to be an epic encounter as Upper Clutha took on Arrowtown in a battle to hold a spot in the top four. Both teams were neck and neck throughout the match in what was a battle of attrition on a fast, dry pitch in Tarras. Unfortunately for the Rams, Arrowtown was able to hold onto its slim lead in the dying minutes of the game, winning 32-26. The first half kept the strong crowd in attendance well entertained as tries were scored by both teams in succession. One of the early highlights was Ben Purvis running onto the ball close to 40m out, and using his notorious step and running strength, was able to beat three defenders on his way to scoring. Another of the best plays of the game was when the Upper Clutha boys were putting a number of phases together pushing into scoring territory. Just when it looked like Arrowtown might have done enough to hold Upper Clutha out – Scotty Cunningham, in his blazer game, pulled off a miraculous pass more often seen on the basketball court than the rugby field, which allowed Fraser Dowling to tumble over. The Cunningham influence on the game didn’t end there, as Scotty’s brother Jared, who was also playing in his blazer game, had a big impact off the bench in the second spell. Taking the ball quickly off the back of the ruck close to the line, he was able to dot down to keep Upper Clutha’s nose in front. Arrowtown did not give up, and was able to score again with only a handful of minutes on the clock. The Rams did everything to get that much needed try to win, even with Arrowtown being down to 13 men, but the final whistle blew with Upper Clutha being held up over the line.